A white diffused filter for the 23mm lens Nitecore flashlights. Gives a softer shade of light from the flashlight which is easier on the eye, especially good for when the flashlight is used like a candle or when the flashlight is used in confined spaces or when you are prone to get lots of reflection etc. Purchase through PayPal by using the "Add To Cart" button above or use the form below to order the Nitecore 23MM Filter (Diffused white) . 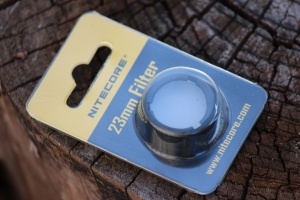 Feel free to contact us if you have any questions about the Nitecore 23MM Filter (Diffused white) .